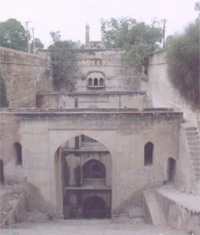 Mertani ji ki Baori is the most ancient and enticing structure in Jhunjhunu. It is a step well popularly known as ‘Baori’ in olden days. 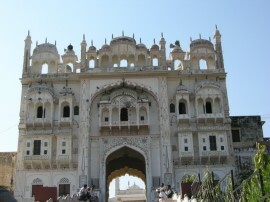 Rajasthan being a desert area, such step well constructions are considered to be a fine example of rare architecture. It lies at the northwest of the fort. Build in 1783 A.D., it is known to be one of the most impressive step well of Shekhawati era. It was named after the woman who commissioned it, Mertani, widow of Sardul Singh. The Mertani Baori is an attractive structure with a series of steps descending through arches. On the other side of the Baori, the steps lead to a number of rooms for visitors to rest. The main purpose of this ‘Baori’ was to serve the local people. It was a major community centre for local residents, who primarily gathered to collect water for their day to day activities. The step well has already been restored and it is approximately 30m deep. It is believed to contain sulphuric water used to cure various skin ailments. However quite contrary to this existing belief, in 1930, an English official after examining the water of Mertani Baori mentioned in his report the water to be of quite poisonous nature. He also stated that the consumption may lead to sudden death within few hours.